Need some heavy duty brush cutting done? Jungle Busters to the rescue! Our team of highly skilled, certified operators have years of experience with brush cutting. We deal with the most extreme and difficult jobs with efficiency and safety. We use heavy duty equipment and make sure that the job is done right. We can operate with light line to cut gardens, footpath edges and parks whilst minimising throwing any objects or super heavy duty, square cut line to cut through the heavy and thick grass and weeds. 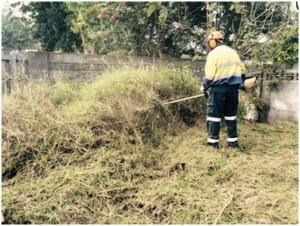 Jungle Busters has extensive experience in a variety of brush cutting jobs, from roadside work for Brisbane City Council and Main Roads to clearing land for development to brush cutting parks and gardens. No job too big or too small. Call us to find out how we can help you.